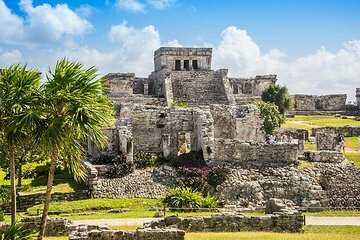 See two Riviera Maya archaeological sites in one day on this day trip to the Coba and Tulum ruins from Cancun. This tour is a deep-dive into Maya history and culture: meet with a modern Maya community and explore two important historical sites with the benefit of commentary from an in-the-know guide, all in just one day. We were so surprised by how much fun we had on our tour! Tulum was beautiful and although it was busy with other large groups, I'm glad we got there before noon because as we were leaving hundreds of people were outside the site in line waiting to get in. Be sure to use the restroom at the first restroom stop before entering Tulum. We were sad to see the beach was closed off because of the tide but spending only an hour at the site was more than enough time to walk around it completely and take pictures. From there we headed to lunch in Coba. The food was a little bland for our liking and catered more to tourists than a traditional meal. Coba was amazing! My boyfriend and I decided to climb the pyramid, the views from the top were worth it! Don't pay for the bicycles, the walk isn't too long and along the way you can see and walk through more ruins. The cenote was probably our favorite part. I'm so glad our tour group was small and got there when we did. It was almost empty when we got there. I recommend wearing a lifevest, it is difficult to tread water for that long and bring an extra towel because the water was cold then having to get into a cold van after was not fun. Along the ride from all of the sites our tour guides told us lots of history and information about all of the areas we were traveling to and of the people living there. We learned alot! The tequila tasting at the end was a nice surprise! The tour ends at a gift shop which was convenient because it allowed us to get some shopping done before we headed home. A great end to our trip! However, if you are not familiar with spanish, brush up before this trip! The tour was mostly spoken in spanish, and almost everyone in our group only spoke spanish, so it was great practice for us and a way for us to bond with the other people on the tour.